Thanks to the researchers at Mississippi State University under contract with the Missouri Department of Conservation, we now have a much more accurate idea of what bears do in the woods. In Missouri at least. The Missouri Black Bear Project aims to quantify the number of bears in the state of Missouri so that a comprehensive management strategy can be developed. Bears in 23 southern Missouri counties have been trapped and fitted with GPS collars. Some of these bears’ tracks are shown on the website. You can select an individual bear and follow its trail on a map. We were amazed to find that bears regularly visit areas where we hike! 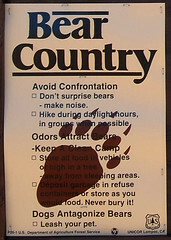 Many of the trailheads in Southern Missouri have signs educating people about what to do if they see a Black Bear. The Dept of Conservation has more information about Black Bears in Missouri. Are you curious if there have been any bear sightings near you? MDC has a map of bear sightings. You can even see how the bear population is concentrated in the southern part of the state. Remember, Black Bears are not dangerous and aggressive like Grizzly Bears out west, so there’s no need to be afraid to go out in the woods. But there are basic guidelines, mostly common sense, that will help keep both you and the bear safe if you’re ever lucky enough to see one. BTW, if you were thinking of the other thing that bears do in the woods, we have something to say about that, too.